From SD Toys. 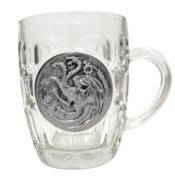 Sit back, relax and have something to drink with the Game of Thrones Targayen Crystal Stein with Metallic Logo! This stein features the Dragon sigil of House Targayen in a metallic design. Whether you're buying for your friends, family, or for yourself, this item is the perfect gift for any Game of Thrones fan.